Reports are coming in that a 7.0 earthquake has hit Sichuan, China. It is reported that some people have been killed in building collapses, in a town near the epicenter. I'm also seeing reports that Bifengxia has suffered some minor damage, but all staff and pandas are well. Reports say that the pandas were scared during the earthquake and after shocks, but have now gone back to their normal routines. I'm also told that the road between BFX and Ya'an the closest city has been damaged, and staff are having to walk. I will update again if I hear anymore. Reports are coming in that a 7.0 earthquake has hit Sichuan, Chian. 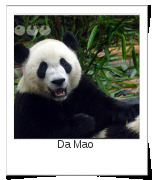 The Toronto Zoo has announced that five year old Er Shun (female) and four year old Da Mao (male) will be arriving at the zoo on the 25th of March 2013. The zoo hopes that the giant pandas and the new Eurasia pavilion will be ready to go on show by the May long weekend. The pandas will spend five years at Totonto Zoo before being moved to the zoo in Calgary. Unless Er Shun becomes pregant before the move, in that case the pair could stay longer in Totonto. SKY orders "Pandas in 3D"
The TV Wise website is reporting that SKY 3D is going to produce a show about how Chendgu China Conservation and Research Centre is going about releasing pandas in to the wild. It will follow mother pandas who are being allowed to give birth to their cubs in a semi wild but closely watched environment. The pandas will not have any human contact except with keepers who will wear special panda costumes which have been scented to smell like pandas and not humans. Currently there is no date when the Documentary will air, and if it will be available on other 3D channels apart from SKY 3D. Edinburgh Zoo has released a short video (Shot by Alison MaClean, head panda keeper) of what happened when they introduced a new ball in to her enclosurer. They said that when Yang Guang found his he just sniffed it and walked away as he couldn't eat it. He's perfers food treats. I can't believe it's been so long since I have posted here on Panda News. Things have been very busy, including illness and a death in the family and so much work. It seems life might be slowly returning to normal. So I'm planning on putting more effort in to Panda News. So watch out for some news stories in the coming weeks. San Diego's new Cub is fast approaching 100 days old, So it will soon be time to name him. The Smithsonian National Zoo has sent out a report on the cause of the death of Mei Xiang's Cub, who died at only 6 days old. The full Email is included below. I just want to give my thanks to everyone who voted for me to have a chance of becoming a Pambassador. Once again many thanks to everyone who voted to give me the chance of this wonderful experience. 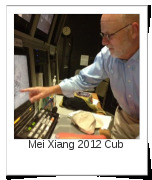 It is with great sadness that I report that the cub that was born only 6 days ago at Washington DC Zoo to Mei Xiang has died. After 6 long years Mei Xiang from Washington Zoo Gives birth. It's been 6 years since the Giand Panda sweat heart Tai Shan, was born and now Mei Xiang and Tian Tian are parents again. Details are a little thin at the moment, but watch this space. Congratulations Mei Xiang, and everyone who cares and looks after them. In June a set of infrared triggered cameras were set up in the Blackwater River Nature Reserve. 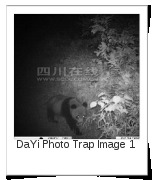 In August they had capatured images of two wild pandas in the area. The cameras are being used to help research panda activity in the area.